We’re pleased to that our Pack will start accepting Lions this fall! 1. So what is a “Lion” Anyway? The Lion program, like all of Scouting’s programs, weaves the concepts of character development, leadership skills, personal fitness, and citizenship into activities that are age-appropriate and fun. “Adventures” (themed sets of activities and experiences) will assist Lion families in exploring the world around them. 2. What Will the Lion Experience Be Like? As they complete the requirements for each adventure, Lions will earn an adventure sticker to be placed in their Lion Adventure Book. Lions earn stickers, but not adventure loops (belt loops) as they will do in Cub Scouting. Moreover, Lions will be led by parents filling the role of “Lion Guides” and will meet as dens of 6-8 kindergarten age boys. Lions will wear their own approved uniform, a Lion t-shirt! It will be available in pilot-approved Scout Shops to help the Lions feel unique and special. 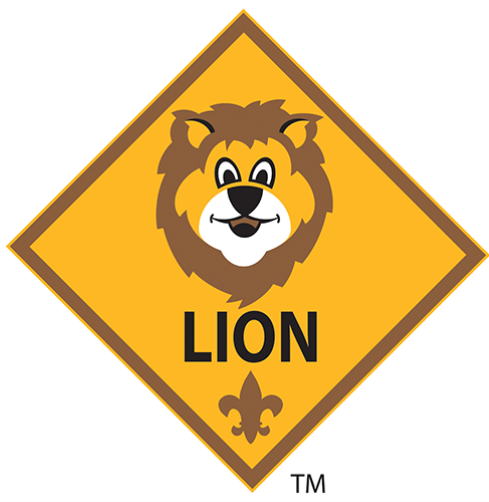 Lions should not wear the Cub Scout uniform until they are old enough to officially transition into Cub Scouting as a Tiger. 3. Is there Any Involvement with Cub Scouts? Of course, Lion dens may be invited to participate in a few pack meetings, but care should be taken to ensure that any meetings they attend are fun and engaging for boys of Lion age. Boys are restless by nature…younger boys even more so. Late nights, long meetings, lots of sitting and listening should be avoided for Cub Scouts and Lions alike. Instead, meaningful and fun activities should be planned for Lions in any meetings they attend. 4. When do Lions Become Cub Scouts? At the end of the kindergarten year, Lions will “graduate” into Cub Scouting as a Tiger…where they will continue their grand adventure in Scouting, where future memories will be made and Cub Scout activities await. We look forward to including Lions into our pack, especially since we’ve had some little brothers that have been dying to be a part of our unit!